On Saturday, I did something quite rare, I ventured out without Emily! Shocking I know. I have always struggled to leave her, due to my post natal depression but now she is older I am finding it easier for to leave her. I think because she is now at an age where she can tell whoever she is with what she wants, it makes me feel a little bit easier. Before I was constinately worried if she was ok, or if she wanted something but couldn’t tell anyone but now I know that she can ask for whatever she needs. A friend had been trying to convince me for a while to have a baby shower but they are not really my thing. The fuss, attention and cheesy games just don’t appeal to me. I wouldn’t mind attending someone elses baby shower as I do think they are a lovely idea, they are just not something I want for myself. We did however compromise and a few of us went out for a meal at pizza express. There was only nine of us, because many people couldn’t come but I had the loveliest time. I forgot what it was like to just be child free, concentrate on eating a hot meal and not have to worry if my toddler is putting her dinner all over the floor. While I did feel like I had lost a limb, I know that it was nice for Emily to get to spend some quality time with her daddy – plus unlike me she didn’t even care that I wasn’t there. For as long as I can remember, both family members and friends have made me feel guilty about not leaving Emily. They said that she would be clingy, and insecure when I wasn’t around but that couldn’t be further from the truth. She is so confident and happy, she didn’t ask for me once or miss me. She was absolutely fine, and all the worry and guilt I have been carrying regarding leaving her, was for nothing. Anyway, back to the baby shower. We had a lovely meal, I went for the American hot pizza, with a side of dough balls and it was delicious. My auntie and best friend had arranged for the most gorgeous cakes to be made, and I’m so thankful for that – it was a lovely surprise. 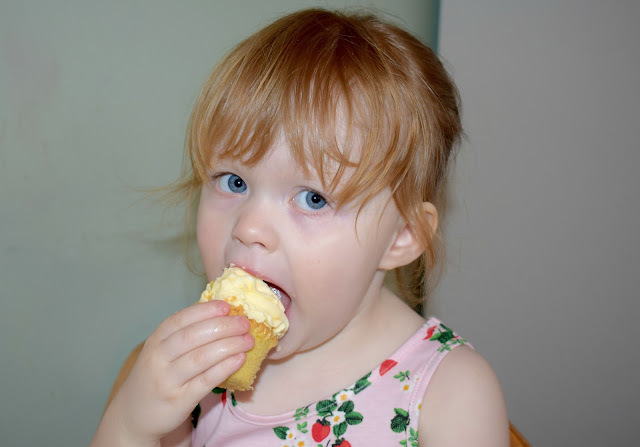 My auntie got a jam and cream sponge cake made, and Toni got some vanilla and chocolate cupcakes made, which had a yummy filling inside. The cakes looked amazing, and were too good not to share with you guys. I feel like such a rubbish blogger, as I managed to get like no pictures. 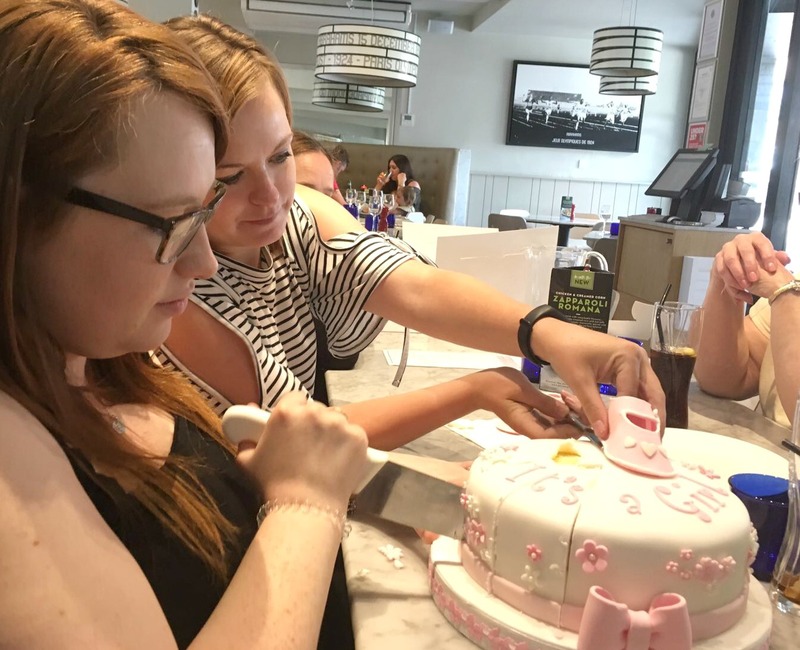 Someone snapped this picture of me and Toni (my best friend) cutting the cake, which was actually a lot harder than it looked as the knife was huge! Just want to say thank you to everyone who came to my shower and the lovely gifts that baby girl was brought. I know there were people who couldn't make it, but would of been there if they could. 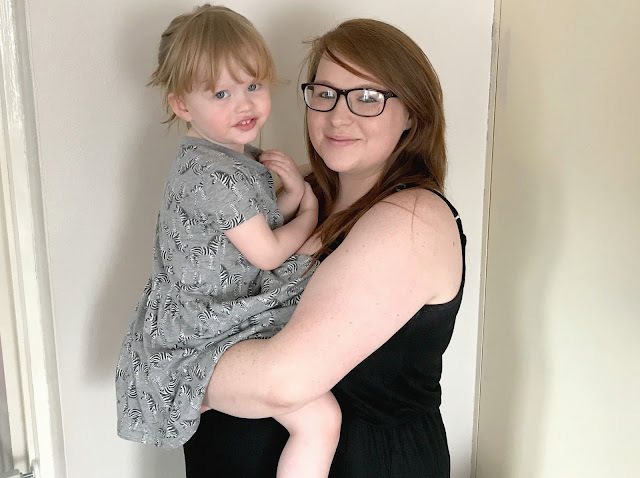 In my life I have constantly tried to please everyone at the cost of my own happiness, when I fell pregnant with Emily my whole attitude changed, I have distanced myself deliberately over time, from the negative people who were in my life. It's been really hard, especially when some of those people are supposed to be family, but I am a more positive and happier version of myself. Ultimately that is what matters. 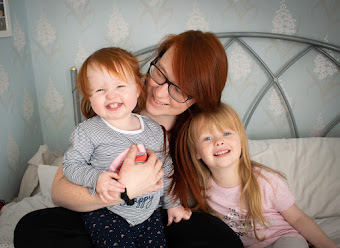 I know that the people who are in my girls life, are dependable and will always be there for them, to watch them grow and help them with all they may need. For that I am so thankful. I'm a big believer in quality over quantity. Life is what you make it, and the people you choose to surround yourself with should reflect that. Positivity is everything, life is to short to be anything other than happy, and that is one lesson I really hope to teach my girls. Those cupcakes and cake look amazing! And what lovely memories you've created having the baby shower! It sounds like you have a great circle of friends and those cup cakes are so cute!! 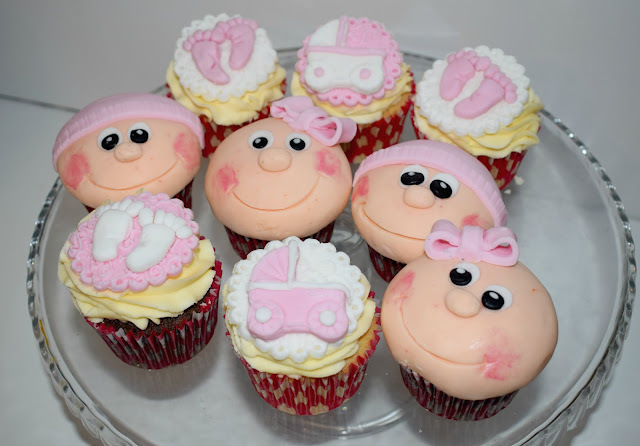 Aww it looks like you had a fabulous time and those baby face cupcakes are just the cutest! Aww lovely. 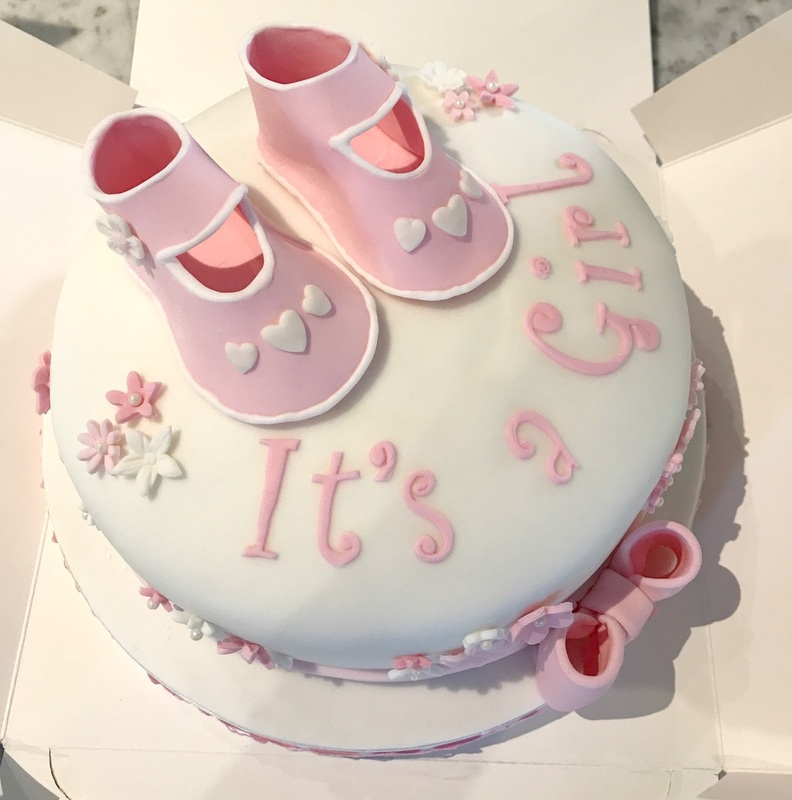 I always wanted a baby shower but I guess I'll never get one now ( :( sob). Glad you had a great time and good luck counting down to baby's arrival! 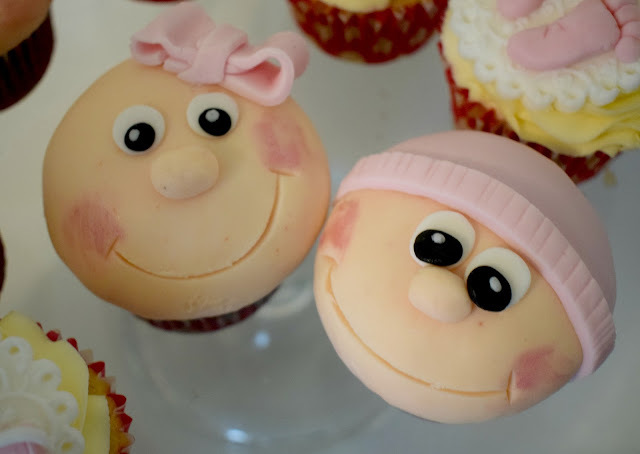 Aww, it looks like you had a brilliant baby shower. Those cupcakes look amazing! !